With the 26th overall pick in the draft, the Red Sox have selected Michael Chavis, a shortstop from Sprayberry High School (Marietta, GA). 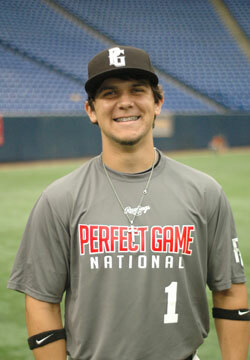 Chavis, 18, is expected to move to third base as a pro, but is athletic enough that second base is also a possibility. Chavis was ranked 20th by Perfect Game USA and 26th by Baseball America (BA), and is considered one of the best high school bats in the draft. Baseball Prospectus described the 5-foot-10 infielder as a "potential top-10 talent," and BA says the Clemson commit has plus bat speed and plus raw power. His above-average arm profiles well at the hot corner, and he will most likely settle in as an average runner according to BA. Chavis hit .580 with a .663 on-base percentage as a senior, slugging 13 home runs in 81 at-bats. He was named the Gatorade Georgia Player of the Year in 2014. Scouts have praised Chavis for his strong work ethic, and Chavis said he modeled his game after Dustin Pedroia in his interview on MLB Network after being drafted. While Chavis is a solid defender, his bat is what should carry him through the minors. The last high school position player the Red Sox drafted this early was catcher Blake Swihart, who was also taken with the 26th overall pick. The 26th pick has a $1,870,500 slot value, and it should take most of that to buy Chavis out of his Clemson commitment. Photo credit: Michael Chavis from perfectgame.org.